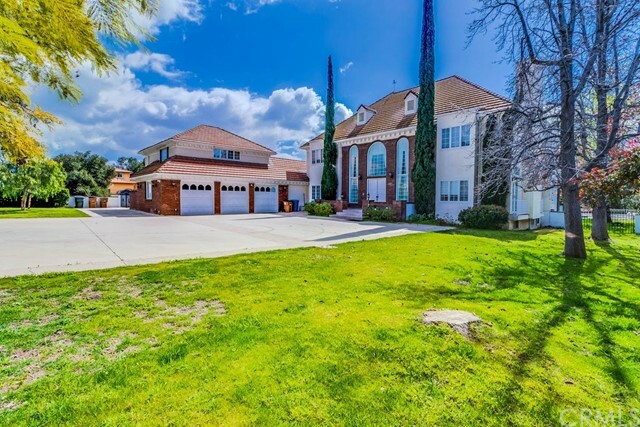 All Claremont homes currently listed for sale in Claremont as of 04/23/2019 are shown below. You can change the search criteria at any time by pressing the 'Change Search' button below. "This contemporary gated resort-like estate, constructed in 1992, is nestled in the foothills below Mt. 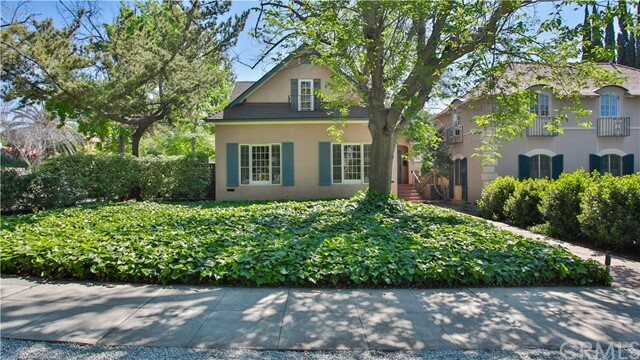 Baldy and sits on a 56,038 square feet south-facing lot in prestigious neighborhood of Claremont. This custom home built by architect Peter Volbeda, AIA, o?ers 6,007 square feet of living area including 5 bedroom suites plus powder room, expansive entry foyer, formal library, living room, family room, gourmet kitchen with butler pantry, breakfast area, sunroom, wet bar, fitness room, office/reading room, laundry room with sewing center as well as gallery halls. The acreage is fully landscaped with mature specimen trees, drought tolerant plantings, decorative hardscape, and lighting, putting green and sports court and private patios with fountains. The lush surroundings complement the three structures positioned for privacy and visual integrity. The back house is found at the end of the long driveway by the pool. Built in 2003, the 1,933 square feet of living space of a contemporary design provides a private guest quarter with full kitchen, and a large entertainment center, inclusive of a wine room. Private patios overlooking the pool and a pond add to the serenity and seclusion. By the pool, a third 400 square foot building features a full patio bath and a built-in barbecue kitchen and 2 spacious storage rooms. in 2017 owner upgraded luxury white oak wood flooring." "Classic Alamosa Grove house re-imagined 2016 into a stylish Eden on over an Acre of heavenly grounds complete with guest house, ultimate car lover s garage, artist studios, and native fruit orchard. Chic high end upgrades with artistic flair enhance interior rooms, including a high impact great room featuring exposed beam ceiling & dramatic travertine fireplace, and glamorous master suite with show stopping dual bath with backlit onyx shower, star quality closet and dressing area. Detached guest house approximately 800 sqft and attached apartment/gym with private entrance. Four car celebrity status garage features two RV bays and custom finishes in a temperature controlled environment. Adjoining the garage are a collection of studio rooms, lofts & bar over 1900 sqft with a rustic industrial vibe ideal for entertaining or creative pursuits. Modeled after famed Conway Studios in Hollywood, these artistic spaces can also be used for additional guest bedrooms. 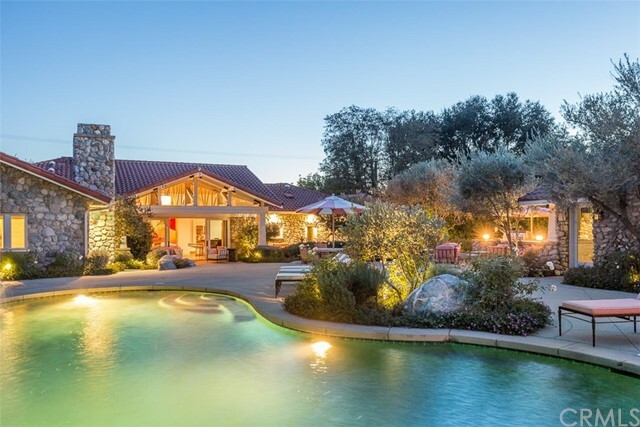 Expansive grounds offer peaceful foothill views and exceptional outdoor areas for the grandest of garden parties, including a large covered cabana, sparkling pool & spa with rock grotto, and outdoor kitchen with fire pit. 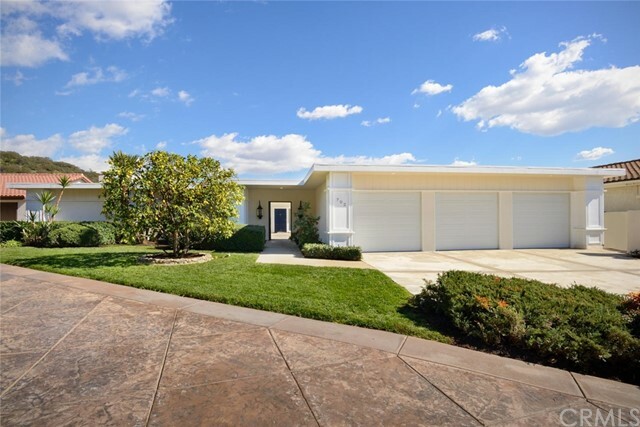 Native orange and lemon groves along with lush landscaping create an idyllic estate setting. Claremont, the City of Trees & PHD s offers an exceptional school district, vibrant downtown Village, and Metro Station with connections to all of Socal. 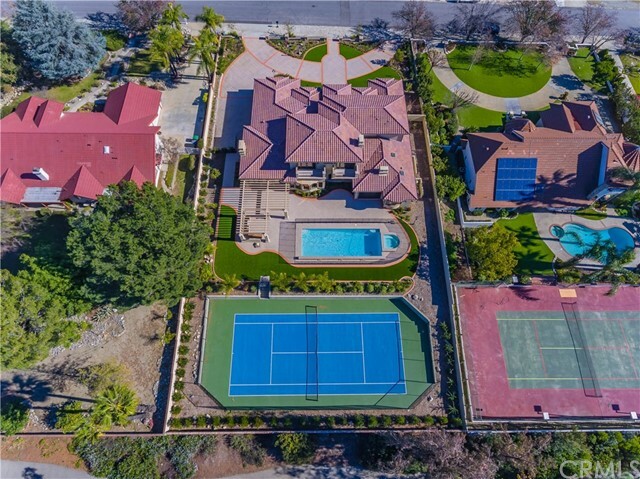 Live the dream in this rare foothill estate!" "IT'S A DREAM COME TRUE! THIS BRAND NEW CUSTOM HOME OFFERS 180 DEGREE PANORAMIC MOUNTAIN VIEWS. OPEN EXQUISITE WROUGHT IRON FRONT DOORS TO THE SPIRAL STAIRCASE AND GRAND FOYER WITH DRAMATIC SOARING CEILING. NO EXPENSE SPARED IN BUILDING THIS DREAM HOME FROM THE LIGHT FIXTURES, TO THE FLOORING AND CROWN MOLDING. THIS GORGEOUS HOME OFFERS OPEN FLOOR PLAN WITH 4 BEDROOMS+5.5 BATHROOMS+HOME THEATER+EXERCISE ROOM+OFFICE + 3 CAR GARAGES PLUS BUILT IN OUTDOOR BBQ, SPARKLING POOL AND SPA, TENNIS COURT. MASTER SUITE ON MAIN FLOOR, SPACIOUS MASTER BEDROOM/DUAL FIREPLACE, STEAM SAUNA,DUAL SHOWER HEADS IN THE BATHROOM. GOURMET KITCHEN FEATURES PREMIUM QUARTZ COUNTER TOPS WITH MATCHING CABINETS,SELF CLOSING DRAWERS, COMMERCIAL GRADE GAS STOVE, DOUBLE OVEN, HUGE DOUBLE CENTER ISLANDS WITH MANY SITTING AREAS. BIG FAMILY ROOM WITH REMOTE CONTROLLED FIREPLACE IS PERFECT FOR FAMILY GATHERING. HOME THEATER ON MAIN FLOOR OFFERS BIG SCREEN, BUILT IN SPEAKERS, NEXT TO THEATER IS EXERCISE ROOM. BIG FORMAL DINING ROOM, BUILT IN WINE CLOSET WITH COOLER. OFFICE WITH BUILT IN BOOK SHELVES, WHOLE HOUSE WATER FILTERING SYSTEM, LIVING ROOM WITH FIREPLACE, OFFERS VIEW OF THE POOL. BALCONY OFF TWO BEDROOMS UPSTAIRS, TO TAKE IN THE MORNING SUNRISE AND SUNSET. YOU'LL ESPECIALLY LOVE THE SPECTACULAR GROUNDS WITH SPARKLING POOL, YOUR OWN TENNIS COURT. ARTIFICIAL TURF IN FRONT AND BACKYARD IS WATER RESISTANT. WALKING DISTANCE TO WILDERNESS PARK, HIKING TRAILS. CLOSE TO SHOPPING,FREEWAY. OWN YOUR OWN PARADISE!" "PANORAMIC MOUNTAIN VIEWS! 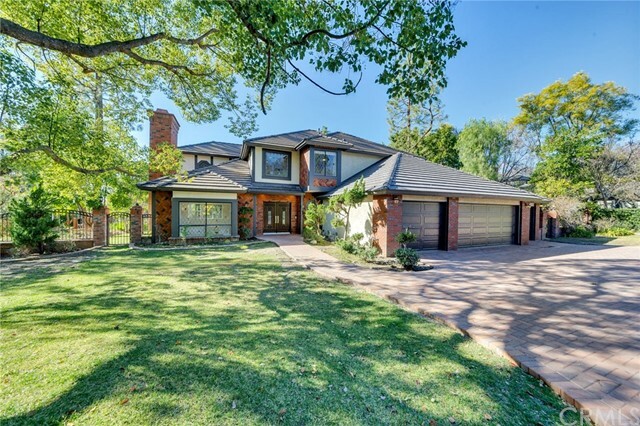 This Luxury Custom estate is situated in the prime area of North Claremont. Pull up to an exquisite circular drive that invites you to the grand double door entrance. Once inside prepare to be impressed by the stunning foyer and soaring ceilings, Spacious formal living room and dining rooms are perfect for formal affairs and all manner of entertaining. The large professional kitchen is surrounded by gorgeous cabinetry and granite counters with professional grade appliances, dual dish washers, built in fridge and a walk-in oversized pantry. The grand entertainment room or family room is in the center of the home just off the formal entry, it offers a spacious gathering area with marble fireplace, a custom full wet bar & game room with a hand carved oak pool table. Go outdoor's and find a full size chefs kitchen, built-in bbq island with outdoor oven, full bathroom with shower and an amazing sparkling pool/spa/waterfall and that allows for all kinds of family fun. The interior also includes an oversized library/office that is perfect to work at home or cuddle up with a great book & relax. There are 3 beds & 2 baths downstairs perfect for guests or in-laws. Up the sweeping staircase you will find an oversized master bedroom with a private balcony overlooking the backyard and more than amazing mountain views. Bring all your toys & vehicles, we have a 4-car attached garage, RV parking & carport. If you re looking for an absolute dream home this is it." "MAGNIFICENT CALIFORNIA MONTEREY STYLE ESTATE IN PRESTIGIOUS STONE CANYON PRESERVE. Perfectly perched on a premium, over half-acre lot, at the end of a quiet cul-de-sac street locale. Tastefully upgraded inside and out, this home features a light filled floor plan with high ceilings. High quality hardwood, tile , and carpeted flooring. Gourmet kitchen complete with stainless steel appliances, granite kitchen counters, plus 2 large islands that open to the family great room. Master suite includes a double sided fireplace, relaxing retreat, and a private balcony with valley and city light views. Lavish master bath boasts luxurious appointments. Spacious downstairs bedroom with full bathroom. Resort style backyard with sparkling swimming pool and spa, custom covered patio pavilion with fireplace, BBQ station, fire pit, plus breathtaking mountain views. Attached 3-car garage plus additional 1-car garage parking. 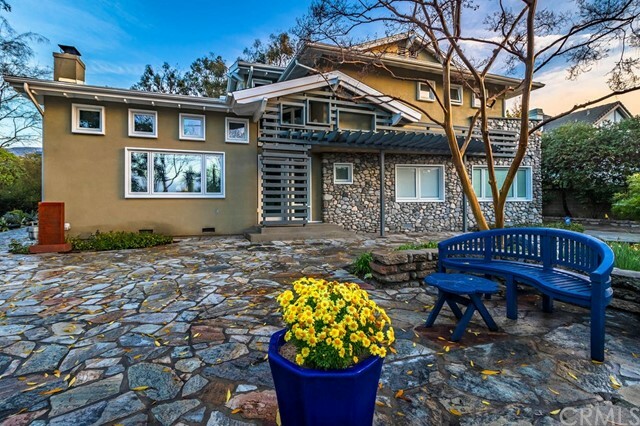 Coveted locale near the picturesque foothills, Claremont Wilderness park, and hillside trails. Don t let the opportunity to make this house your home pass you up!" "Be prepared to be wowed by this unbelievable estate located in N/E Claremont. This privately gated, incredible property awaits a new owner. This home has so much to offer. Enter through the double doors to find the sweeping double staircases that greet you and set the stage for this grand estate. There is a flowing floorplan that carries you through the home to very large and spacious rooms. The scale of this home will impress you. The high ceilings and lots of windows keep this home open and bright. There is a beautifully updated kitchen with professional grade appliances and a large center island with plenty of room for casual dining. The secondary bedrooms are very large. The luxuriously appointed master suite is a true escape. It boasts tons of room and lots of closet space. There is a pleasant surprise when you discover the basement that is the perfect spot for a man cave, wine cellar or kids play room. The fully contained guest quarters above the garage is ideal for nanny or granny, boomerang kids or a completely separate home office. The options are limitless and add huge value to this property. Outdoors you will find your own private resort perfect for those staycations. Why leave home when you have a sparkling pool and spa, a regulation sized N/S facing tennis court and gorgeous, manicured grounds? There truly is something here for everyone. Ideally located near the Thompson Creek Trail & the Wilderness Park you also have outdoor recreation activities close by!" "Immaculate Tuscan-inspired estate located in the desirable Stone Canyon Preserve of Padua Hills! Professionally designed front and back yard landscaping! Elegant arched doorway leads to a formal living room with high quality french wood floors, a formal dining room, two-story high ceiling family room with gorgeous fireplace. NEWLY INSTALLED wrought iron stair railings not only add value to the house but also make for a lovely addition to the staircase. Bathrooms are NEWLY upgraded with marble and most closets are newly equipped with organizers. Master bedroom was HIGHLY upgraded with velvet fabric wall paneling and wood half wall panel . The gourmet kitchen has stainless steel appliances and features a butler's pantry, an expansive counter that seats 5-6 comfortably; all overlooking the mountain view. Two bedroom suites on the main level and four more bedrooms on the upper level with ceiling fans, recessed lighting and shutters. Additionally, this home has a three-car garage, RV parking drive way, sparkling pool, spa, covered patio with fireplace, a playground and more...Seller spent $300,000 to upgrade whole house. It is turn key condition! A must see gorgeous!" 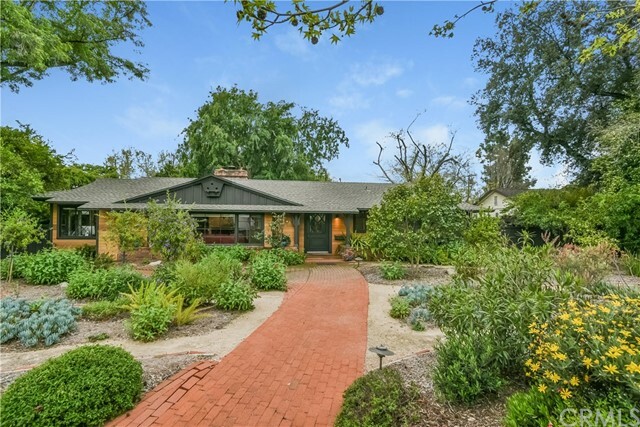 "This custom estate with large GUEST HOUSE located in one of the most desired neighborhood of NORTH CLAREMONT. HUGE AND ALL FLAT (32,518 SF) LOT. Double door entry with high ceiling, Very open floor plan with 6 Bedrooms and 7 Bathrooms (one bedroom with full bathroom downstairs plus office). Newly upgraded with new water heater, new interior and exterior paint, new pergo/new carpet flooring throughout. Family room with fireplace and large wet bar. Formal dining room with hardwood flooring. Upgraded master bathroom with granite counter top and new cabinet. 3-car garage attached plus RV parking. Completely private huge park-like backyard with covered patio, pool/spa and fruit trees. Large guest house features living room with fireplace, full kitchen and one bedroom with full bathroom. Walking distance to parks and wilderness walking trails. Only a few minutes from The Webb private school, shopping, Claremont Village and Claremont Schools. Cul-De-Sac location." "If views are important to you, look no further! This home offers both stunning canyon views by day & twinkling city light views by night! The stunning 12 wrought iron Canterra doors set the stage. The appointments throughout this property are amazing. There is crown molding throughout, gorgeous chandeliers & fixtures, custom built-in cabinets, plantation shutters & so much more! The kitchen is amazing! There is a huge breakfast bar, center island with prep sink, Viking range & oven, a second oven, double dishwashers, warming drawer, Sub Zero refrigerator & an enormous walk in pantry. Relish cooking in your gorgeous, gourmet kitchen while enjoying the spectacular view of the canyon & valley below. There is an office with custom built-in bookshelves. The secondary bedrooms are spacious & the master bedroom is a true delight. There is a oversized walk-in closet with built-ins, a sitting area & the adjoining master bath is luxurious. You will find a spa tub for relaxation, the separate shower boasts multiple sprays, dual sinks are appointed by gorgeous marble counter tops, the finishes are stunning! Outdoors you will find one of the largest flat pad lots in Claraboya. The patio area is ideal for dining al fresco. The sparkling pool & spa are gorgeous. Entertain your family & friends at your full outdoor Viking kitchen as you soak in the glorious views. The lower level includes a putting green. This is a unique opportunity to obtain the lifestyle experience this home offers." "PRICE REDUCTION ! !A stunning grand custom estate nestled on a quiet cul-del-sac in the desirable North Claremont foothill area. This Contemporary European Chateau is 4,664 square feet, with 5 bedrooms and 5 baths on a large comfortable 34,625 sqft. lot The dramatic shiny marble grand foyer entrance features a high soaring ceiling & curved Wainscoting wood staircase. Just off the entrance is the elegant library, where wood paneled floor to ceiling bookcases dramatically accent the room. Exquisite Coffered ceiling highlights the beauty of the architectural design in the dining room. An open large great room-style family room offers full-size wet bar, & custom built-ins. French doors open to a beautiful backyard and sparkling pool with irresistible shaded veranda for outdoor entertaining.Tranquil backyard with ultimate privacy & fruit trees.Covered patio designed for multiple seating groups to enjoy a break from the sun. The elegant master bedroom suite with spacious coffered ceiling, retreat and fireplace is a welcome reprieve. Custom beauty with unique floor plan:3 sizable bedrooms on the main floor which is perfect for housing extended family or hosting overnight guests. A new tile roof recently put on in 2017 will last many years to come.The interior of the house recently painted.There is potential to put in a sport court in the front of the house . Picturesque grounds include fruit trees, 3-car custom wood garage doors & RV/Boat parking and panoramic mountain views!" "Reserved for the buyer who is searching for a sophisticated lifestyle, not just a house, look no further.This Mid-Century modern, custom home is located in prestigious Claraboya. Architect designed to reflect the perfect siting on the lot, taking full advantage of the unique characteristics of the parcel, it offers a host of amenities. Enter the gated courtyard entrance to be enchanted by flowering shrubs & trees. As you pass through the front door you will find dramatic open living & dining rooms. A beautifully updated, kitchen with its full suite of professional grade Thermador appliances awaits the serious cook. When preparing meals & entertaining family & friends, open the wall of folding glass doors allowing you to truly bring the outdoors inside, moving between the stunning back garden areas to the interior space with ease. Overlook the sparkling pool & spa surrounded by lush vegetation, beautiful gardens & sweeping patios. The space is totally private. Relax in the handcrafted sauna prior to your plunge in the pool! The downstairs master bedroom & bath have been beautifully renovated. The guest quarters on the opposite side of the house have a private entrance. Spectacular valley views allow you to enjoy glorious sunrises, sunsets & city lights from the balcony. Near Johnson's Pasture & the Thompson Creek Trail, this home offers a luxurious lifestyle as well as access to hiking & biking on top rated trails per Sunset Magazine. Condit Elementary School is a bonus!" 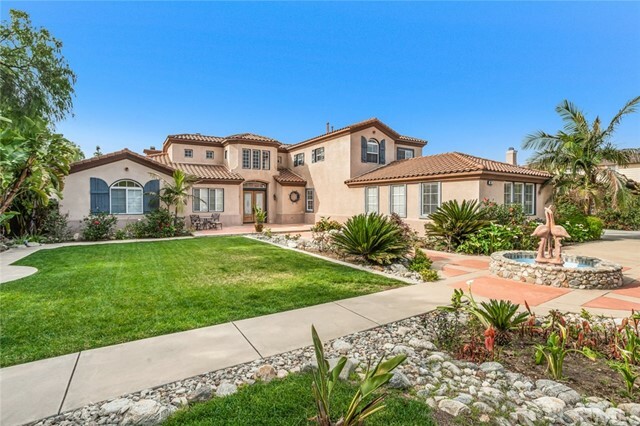 "Welcome to this outstanding sprawling one-story Spanish Estate in N/W Claremont. Be prepared to appreciate all that this property has to offer. Besides the main home with 4,328 sq/ft of living space, there are four over-sized bedrooms with generous walk-in closets, three full bathrooms and one shower/half bath. A chefs kitchen with its enormous island and dining area is open to a elegant formal living and dining room, a family room with step-down bar, a huge laundry room, a bonus/media room with a restaurant size sit-down bar and a generous storage closet. There is a 546 sq/ft one-bedroom addition with kitchenette, fireplace, private patio and separate entrance. Perfect for a guest/nanny/mother-in law! In addition to all these amenities the extraordinary park-like grounds feature a built-in BBQ area with sink, grill and a refrigerator space. The backyard features a refreshing pool and spa with natural free stone back splash and pebble tech bottom, fragrant rose gardens, a fruit and raised bed garden area and enjoy a beautiful mountain views from any of the many entertaining patios scattered throughout the yard. Additionally, the owners just spent over $35,000 for a no-maintenance front lawn, fresh paint inside and out, new front and back irrigation, beautiful new planters and landscaping. Follow the driveway through electric security gates, room for basketball, parking plus, a large fenced dog run and a spacious four-car garage. Update this property and make it your own!!!" 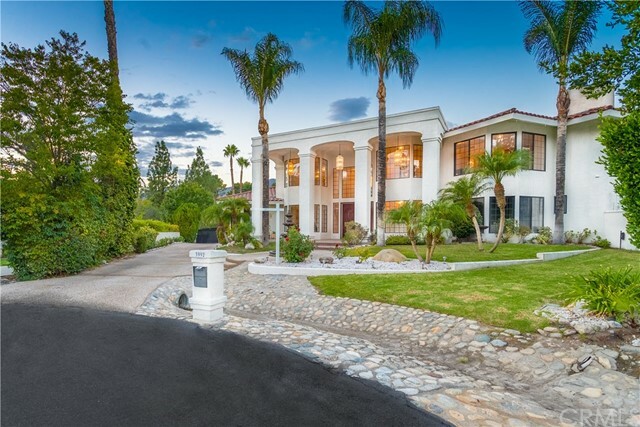 "Luxury at its Finest: Elegant Estate located in one of Southern California's most coveted cities! Located within the Chanteclair Estates at the Grove, this estate is TURNKEY! Welcome HOME! Featuring a spacious elongated driveway, finished 4 car garage and a lush landscaped front yard...formal hardscaped entryway leads to front patio and entrance. Posh custom cut glass, double door entry. 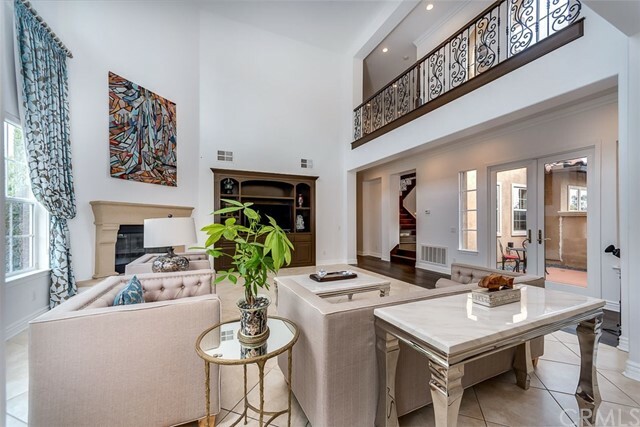 Upon entering, guests are greeted by a 2 story grand foyer that opens to elegant formal living room with fireplace, tall windows, classic draperies, high ceilings, and french doors! Adjacent to foyer, an executive office with majestic view of mountains. Featuring 6 bedrooms and 7 bathrooms this refined home features 4,344 square feet of modern luxury living! The Master Suite with Retreat is conveniently located downstairs and features retreat, fireplace, master bathroom and walk in closet! Additional 2 bedrooms downstairs, 1 with incredible view of outdoors, the other with heated flooring. Gourmet Kitchen features new cooktop, granite countertops, built in appliances, island and nook area that opens to family room with fireplace, media built-in and much more! Upstairs, 3 bedrooms and 3 bathrooms along with beautiful loft. The backyard was carefully and professionally hardscaped and features 2 additional patios. 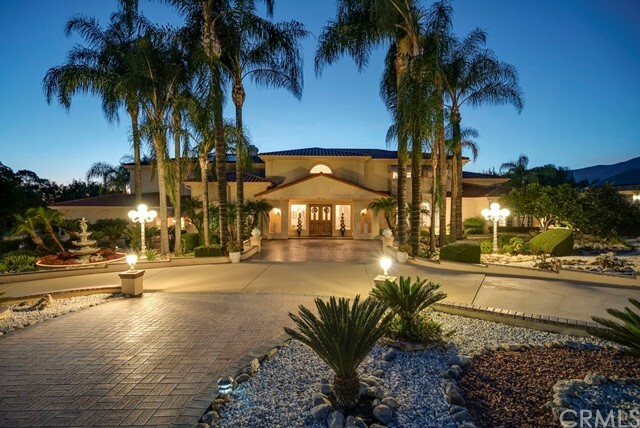 Indeed, this luxurious estate is an absolute Gem-the perfect place for entertainment, relaxing and enjoying the warm sunny days of Southern California!" 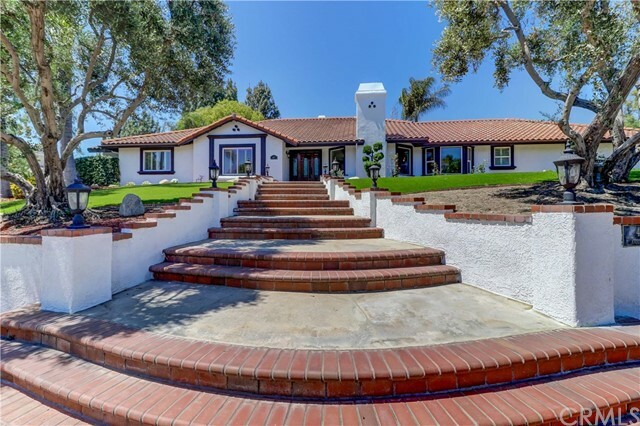 "NORTH CLAREMONT ESTATE HAS BEEN STYLISHLY REMODELED FEATURING CIRCULAR HERRINGBONE BRICK DRIVE, DUAL MASTERS, 4 CAR GARAGE, EXPANSIVE LOT & SPARKING POOL & SPA. DECORATIVE BRICK ELEVATION W/DBL DOOR ENTRY LEADS TO ELEGANT FOYER W/SPIRAL STAIRCASE & GRAND FORMAL ACCOMMODATIONS INCLUDING VAULTED CEILINGS, BEVELED STAINED GLASS WINDOWS, RICH WOOD ACCENT BEAMS & FIREPLACE. CHEF'S KITCHEN FEATURES 2 SINKS, 6 BURNER COMMERCIAL RANGE, LARGE ISLAND W/QUARTZ COUNTERS & FARM SINK OVERLOOKING THE LUSH BACKYARD. ADJACENT NOOK INCORPORATES THE SPACIOUS FAMILY ROOM W/THE KITCHEN, PROVIDING A WONDERFUL SPACE FOR GATHERINGS. A SECOND FIREPLACE, CROWN MOLDING & NUMEROUS WINDOWS HIGHLIGHT THIS AREA. DOWNSTAIRS MASTER INCLUDES ALL NEW ENSUITE W/TILED W/I SHOWER, W/I CLOSET & WET BAR. POWDER ROOM & LAUNDRY ROOM ROUND OUT THE 1ST FLOOR. UPSTAIRS YOU'LL FIND A SUMPTUOUS MASTER WITH HIGH CEILINGS, FIREPLACE, PLENTY OF NATURAL LIGHT, W/I CLOSET, HIS & HER SINKS, JETTED SOAKING TUB SURROUNDED BY LEADED GLASS WINDOWS & PRIVATE SHOWERING QUARTERS W/DECORATIVE STONE TILE. TWO GUEST BEDROOMS ARE GENEROUSLY SIZED - SHARING A LARGE, REMODELED BATH WITH NEW DUAL SINK VANITIES & SUBWAY TILED SHOWER IN TUB. VENTURE OUT BACK TO FIND YOURSELF IN A PRIVATE OASIS MARKED BY MATURE TREES, INVITING SWIMMING POOL, LARGE COVERED PATIO & AMPLE SIDE YARD FOR GARDENING & PLAYING. MONTANA LANE LEAVES NOTHING TO BE DESIRED." "This North Claremont estate on a cul-de-sac of a lovely quiet street in the Chantclair Estates neighborhood has a gorgeous mountain view. This home boasts 6 bedrooms and 7 bathrooms. Through the front door you will be greeted by an open and bright formal living and dining rooms with cathedral ceilings. The master bedroom downstairs features fireplace and spacious bath which includes dual sinks, Jacuzzi bathtub, walk in closet, and separate shower. Spacious kitchen with granite countertops, stainless steel appliances, center island, and built in Fridge. The bedroom off the kitchen works well as a nanny or guest room. 4 car garage. The extremely large front and back yards awaits your most desired landscaping architecture to take shape for your future home." "Modern California style meets contemporary style to create a transitional masterpiece! This home has been completely remodeled & offers the best of modern architecture & custom finishes. Every appointment is gorgeous! This home is perfect for the artist in each of us or those who need separate office spaces for work or projects. The flexibility of the space is amazing! When you reach the front door you will find the curved, custom matte steel sun foil that creates a dramatic entrance to this remarkable home. The foyer has a 22' tower that leads to a great room with a 19' redwood beamed ceiling & cozy fireplace. The dining room is a delight with its curved wall, topped by a double spiral wood ceiling. It is accented with multiple windows of varying sizes & placement, maximizing views & natural light. The kitchen is a chef's dream. Julia Child would be proud. Exceptionally appointed, you will find a British Aga stove, stainless steel countertops, open shelving & a banquette, perfect for casual dining. The master bedroom offers a spacious, comfortable retreat with a fireplace, stunning master bath as well as loads of closet space. Each upstairs bedroom enjoys a private balcony. Downstairs there is a bedroom and bath, two dens/offices & so much more. The exterior is stunning & very private. It has a flagstone patio that surrounds the home & the exterior kitchen includes the grill, sink & cooktop. It is the perfect venue to entertain family, friends & enjoy your own retreat." "Must see this custom built executive estate property in Claremont's prestigious Blaisdell Ranch. The immaculately maintained home boasts 4639 square feet of living space which includes four spacious bedrooms and three baths (including the luxurious master suite) all downstairs, plus huge multipurpose game room and one bath upstairs. Huge living room with marble faced fireplace adjoins spacious formal dining room with wet bar. Elegantly appointed gourmet kitchen with upgraded appliances, lovely cabinetry and center island with granite counter tops. Bright cheerful breakfast room. Double doors open to the family room with brick fireplace and vaulted ceiling. The lushly landscaped serene rear yard offers pool and spa, multiple patio areas, a variety of fruit trees, a sport court and beautiful view of the mountains. There are two separate garages plus a parking court and RV parking. 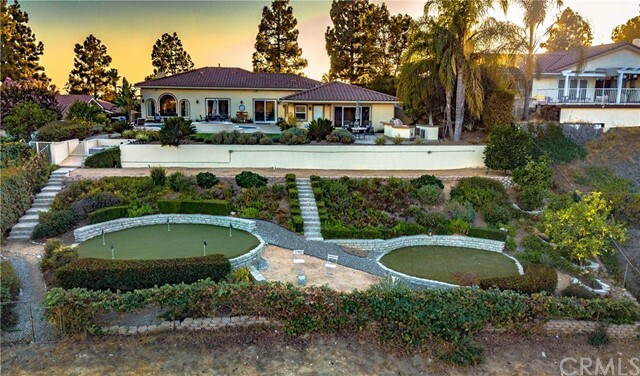 This unique property provides the perfect setting for entertaining and enjoying our casual California lifestyle." 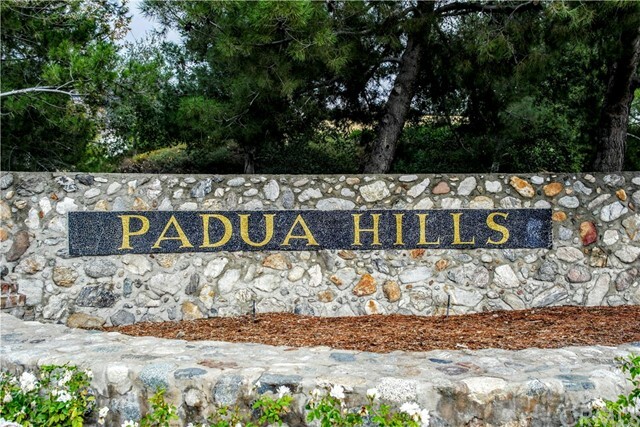 "The Castle nestled in the exclusive Art Colony community of Padua Hills. Featuring 4,716 sq ft of living space situated on a 11,120 sq ft lot above street level, overlooking city and mountain views. Enter the double glass pained doors into a splendid foyer and step into the impressive great room featuring a formal living and dining room. Eat with your family in the breakfast area overlooking the backyard which features, pool, spa, rock waterfall and a serving/BBQ area. Walk up the circular staircase to a luxurious second floor with 2 additional bedroom suites and a generous bonus room with wet bar. A short stroll down the road leads you to the most beautiful panoramic views of the surrounding hillsides, including hiking trails and bike paths for the family to enjoy." "Unique modern rebuild of an historic architectural classic. Completely re-imagined and rebuilt from the ground up with custom design and features throughout. Original architectural details by Don Hershey were preserved at the exterior while being enhanced by a stylish Japanese inspired design with clear cedar siding and brown trim. Entire interior was redone with quality materials & acute attention to detail. Numerous walls removed and support beams installed to allow for a more open flow. Stylish living room with fireplace and floor to ceiling bookshelves, and a recessed TV. The home has a modern kitchen that is open to a central dining area with an abundance of natural light and view to the back patio. New Russound 6-zone audio system with built-in speakers blankets the home and exterior with premium sound. Master bedroom emphasizes light and the natural beauty of the back yard with windows that surround three sides of the room. Both baths are luxuriously appointed with premium cabinetry and tile work, and high end fixtures. Sweeping double lot offers an inviting set-back, as well as resort-like grounds. Step out onto the Kayu Brazilian Walnut terrace, canopied by draping wisteria. Separate side patio is a great place to garden. Custom decorative reflection pool. New electric panel & wiring. New whole house piping. New roof. New mechanical HVAC. New Walls/Fencing. New landscaping. New wall & attic insulation. Certified energy efficiency. 2-car garage + shop + 3 car carport." "Huge price reduced for quick sell. Don t miss out this great opportunity. 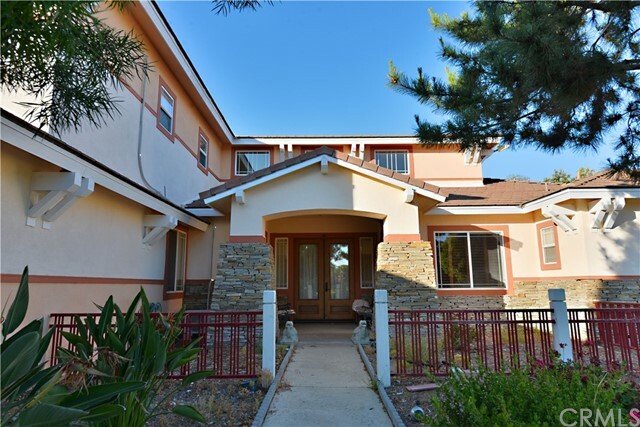 This single story home has a huge big flat lots 36405 sqft (0.836 Acre) and great living space 3633 sqft. This home has 9 foot high ceilings with natural light throughout. 5 bedroom, 4 bathroom, formal living room with a fireplace, large formal dining room. Kitchen is a chef s delight with numerous cabinets, granite counters, center island, built in gas range, double ovens and walk in pantry. Family room with its own cozy fireplace adjacent to the kitchen. Bonus play room perfect as a media and pool table room for family fun. Open & spacious master bedroom has a separate retreat room with a fireplace. Master bathroom includes custom tiled sunken tub, separate shower, double vanities & walk in closet. Relax in the gorgeous lush backyard with covered patio and built in Barbecue. Pebble stone Salt water pool and spa. This home also includes dual water heaters, air conditioner and heater units. Extra insulation in attic, instant hot water in the kitchen, individual laundry room. Earn when you buy it. Make your best offer today." "Extraordinary estate situated in the elegant & exclusive Claraboya community in North Claremont has approx. 3,063 square feet of spacious living space, 4 bedrooms & 3 baths. Offering stunning views of the Inland Empire/Valley, sunsets, city lights & on a clear day you can see all the way to Catalina. This estate is truly one of a kind, with great emphasis paid to small details, to colors & textures throughout making this home feel peaceful. Dual pane floor to ceiling windows - add great light exposure. Fresh exterior paint with beautiful Southwest colors. Step-down, elegant living room is as comfortable as it is gorgeous with beautiful fabric treatment plus fire & ice fireplace. Formal dining room with a wet bar. Remodeled gourmet kitchen features granite countertops with mosaic backsplash, imported Murano glass pendants, Travertine flooring, stainless steel appliances & nook area. Family room with artistic fireplace. Large master suite boasts black-out curtains plus fire & ice fireplace. Completely remodeled master bath with dual sinks, stunning rock & alabaster tile, over-sized soaking tub & glass shower with pebble stone floor that emulates acupressure. Private backyard with amazing views, sparkling salt water pool, above ground spa, covered patio with slate patio decking & fire pit. 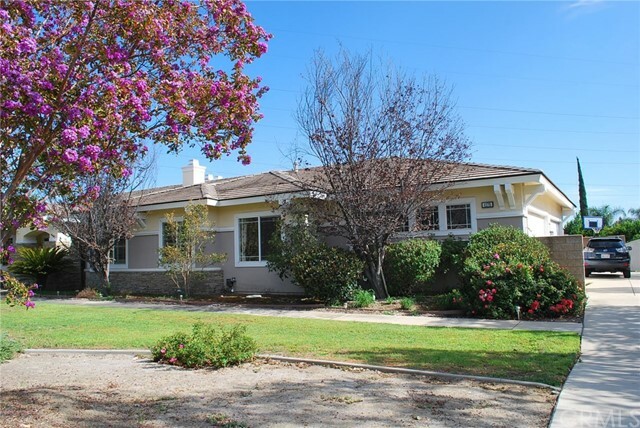 Close to Johnson's Pasture Wilderness Park & Thompson Creek Trail, schools, shopping, the Claremont Village. Commuter friendly with Metro Link & easy access to the 210 freeway." "Beautiful View! 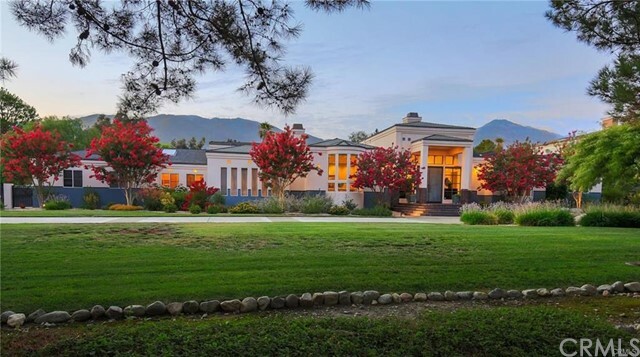 Claremont is known for its charm & character just like this spectacular hilltop estate nestled in the exclusive Claraboya community, at the end of a quiet cul-de-sac that commands majestic views of the Inland Empire, valley, city lights & stunning sunrise. 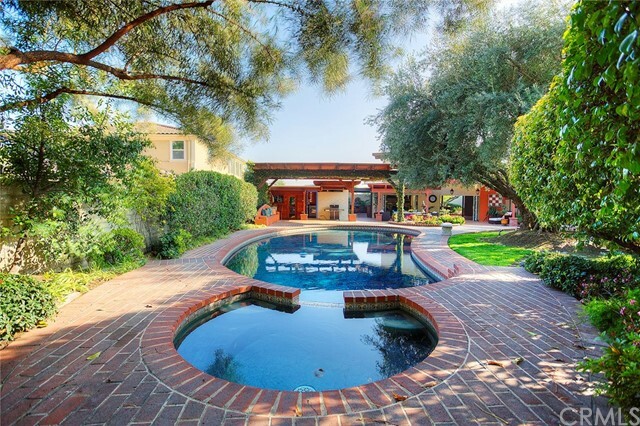 This one of a kind, custom Mid-Century estate has a private, gated courtyard to welcome you into the large courtyard area w/sparkling pool/spa before entering into approx. 3,380 sqft of luxurious living space, 5 bedrooms(Includes 2 master s each w/master bath) & 3 baths. Newer interior & exterior paint, recessed lighting, dual A/C unit, newer water heater & more! Large, elegant formal living room w/cozy brick fireplace, adjacent formal dining room & windows showcasing the beautiful views. Kitchen boasts Granite counter tops, nook area, built-in Kitchen Aid refrigerator & double oven. Family room w/a fireplace & more windows to highlight the canyon views. Large master suite w/stunning views & 2 master closets. Master bath features dual sinks, vanity & step-down shower. Covered patio area in the backyard. Close to Johnson's Pasture Wilderness Park & Thompson Creek Trail, schools, unique downtown Claremont Village, Claremont Colleges, restaurants, Casa 425 boutique hotel & lounge, shopping, desirable Claremont Unified School district, Metro Link station + this property has easy access to the 210 freeway & much more w/too many amenities to mention as this estate is as individual as you with lots of potential." "Four bedroom, two bathroom Tudor style home in prime area of the Claremont Village where one bedroom is downstairs. Brand new roof and air conditioning system with Nest and restored hardwood floors throughout. 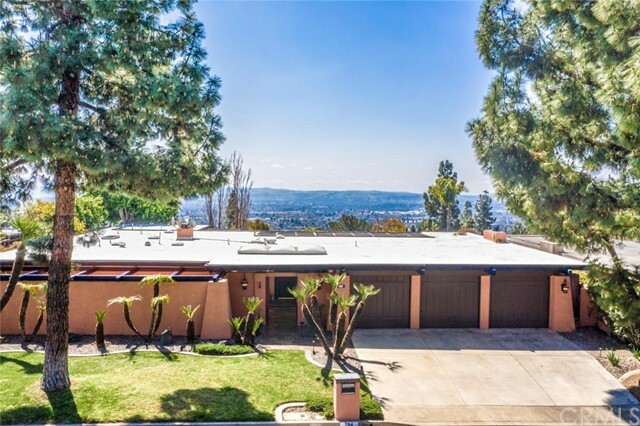 Unique opportunity to own this Claremont gem which has not been on the market since the 1960's. Soaring ceilings, abundant light, and several outdoor spaces provide ample entertainment space. Unique features include a Judson stained glass window, white oak floors, beautifully stained gum wood doors, a butler's pantry and a fairy tale setting backyard with fruit trees. This timeless home should not be missed." "Beautifully light and bright custom built, single level home with a large lot and pool in the desirable foothill community of Claraboya. This home has a wonderfully open floor plan with energy efficient dual pane windows and sliding glass doors throughout that take advantage of the incredible views. Surrounded by tall pines and greenery, there is privacy and peacefulness all around. The gracious double-door entrance and formal entry lead to the the generous living room with a warm fireplace, a quiet sitting retreat and the dining area, all with expansive views. Custom kitchen counter tops and bar open to the den and patio for relaxed living with an indoor-outdoor feel. The dark wood flooring gives this home a modern look and the bedrooms have ample closet space. The master suite includes a walk-in closet, a double vanity and a sliding glass door that opens to the patio. The huge and private back yard and pool make this home perfect for entertaining or just enjoying a weekend at home in a resort-like setting. Excellent schools, proximity to fine dining, shopping and the famed Claremont Colleges make this home ideal for the discerning homeowner."